With pretty bungalows and grassy berms, it looks like any street in just about any Auckland suburb. But Peter Crossley knows better. He lifts the rusty round lid from a manhole beside the footpath, attaches a skinny wire ladder to hooks and rolls it down into the darkness. This is the entrance to a massive cave that runs 250m under Kitenui Ave and surrounding streets in Mt Albert. Discovered accidentally by workers repairing gas pipes in 2006, it's considered Auckland's most significant lava cave find in a century. Crossley is a speleologist (a cave scientist, rather than an adventurer or explorer) who worked at Auckland University's School of Environment until recently. 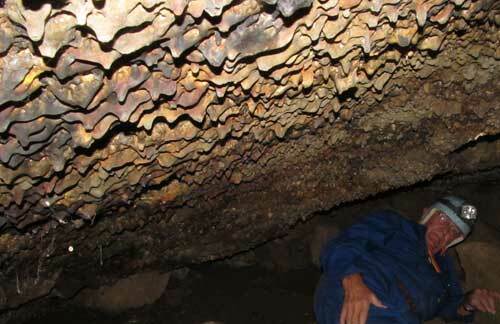 He arrived from England in the 1960s and since then has found 250 lava caves across the Auckland region. He's writing a book about them. Aside from some in the Bay of Islands, lava caves are seldom found elsewhere in New Zealand. They're formed as a result of a specific type of lava being emitted in volcanic eruptions. Aerial sonar is inefficient because possible caves can be confused with what turns out to be loose scoria. And, he says, Google Earth is yet to prove effective because entrances are usually shrouded in shrubbery. When Crossley caught wind of the Kitenui Ave discovery, he couldn't - and didn't - wait to explore. At council meetings he was told health and safety permits prevented anyone entering; Crossley investigated anyway. In the dead of night he and fellow enthusiast Kevin Jose rolled up to the street. After carefully navigating a 4m-deep shaft in the grass, they found a large, arched room, glittering with lavatites and cobwebs. "Oh, it was fantastic," says Crossley, recalling what it felt like to be the first person to explore the 40,000-year-old hole. "When we came out, I got in touch with Bryan Bennett [a council architect at the time] and he said, 'We'd been waiting to hear that you'd gone in there.'." On the day he and Jose take The Aucklander underground, Kitenui cave offers a cool haven from the January heat. In a red boilersuit, Jose leads the way along the upward slanting floor. He points into a narrow space and adopts the movements of a millipede rather than a man, slithering into the damp darkness under 12 properties, stopping just short of an area that eventually opens into a massive chamber. Although Lava caves, like the one above in Three Kings, were formed in the aftermath of volcanic eruptions. Some have been used as cemeteries. Crossley estimates only about 100 people know about it. "You've got to have the right key," he says, levering the lid over the entrance shut with a crowbar. Kitenui has been recognised for its geographic significance. But official protection of caves is only a recent development, making the history of this city's underground network somewhat colourful, complete with a runaway boy, a mushroom farm, moa remains and stolen bones. In pre-European times, Maori hid in caves from enemy tribes or buried their dead in them. In the years that followed the caves were turned into dumping grounds or bulldozed into oblivion. At one time there was a large cave under the site that is now Ascot Hospital in Greenlane. It was filled in during the hospital's construction in 1996. "At the turn of the century, people were certainly looking at caves," says Crossley, whose records are now included in land information memorandums. "People would travel by horse out to Whatipu. They were the dark days when heritage wasn't looked at for many years, up until the 70s, when people began to think about preserving heritage. If you go back far enough, to pre-European times, they were held in high regard as burial sites. They were tapu, places of reverence. Then Europeans came and the Maori recognition of them was overridden. Bones were stolen. You wouldn't go into a cemetery and dig up the graveyard. It's not exactly the same, but it's analogous." In the late 1800s it was reported that bones placed in Mt Eden caves were churned up and used as fertiliser. Crossley has found exciting things in caves. "We found a moa foot [in a South Island cave]. It was 3500 years old. It's bigger than your hand. There was still skin and meat. I must admit there were some amongst us who wondered what it tasted like." In the late 1960s, exploring a cave near what used to be the Parry Rd rest home in South Auckland, he discovered a tangled pile of old walking sticks. "That's always puzzled me," he says. "Was there a taniwha in there who ate all the old folks and spat out the walking sticks? Or perhaps the cave held the elixir of life and they went in there and regained their youth." He tells of a Carrington Hospital patient who hid in a cave on the Pt Chevalier property, and a runaway boy who lived in another beneath Ambury Rd, Mangere Bridge. "We found a mattress up on a ledge." Stewarts Cave, in Three Kings, was a booming mushroom farm until the 60s. The temperature and humidity were ideal for growing fungi and a concrete ramp and shelves were installed. Crossley, who has spent 45 years finding and recording caves, says many are on private property, others have been blocked off or destroyed, but he contends there are still about 50 more hidden in the earth beneath the city. "I've felt frustrated when entrances have been closed off, when I know they're there and I can't get into them." Most frustrating is Scotland's cave in Onehunga, which he describes as a magnificent cave under threat from stormwater being directed through it and huge quantities of silt. Another issue in some of the caves that are known to the public is that rubbish is thrown into them. Working with iwi, Crossley has helped identify caves and ensure their protection. He hopes his book - a work in progress - will go some way to helping people understand their importance as potentially sacred places and as significant geological features. For Crossley, the attraction to caves is multi-faceted. From the sport of it, to surveying, to photography, he says there's camaraderie and friendship. "There's a variety of things. You've got to trust who you're down there with. There's a bond between you and someone else when you're a couple of kilometres underground. There's always the danger of gas in lava caves. "There's the enjoyment as a straight sport, of going through and looking at it. "There's looking for them and finding them and that sense of going where no man's trod before. You need to be agile, slim, tough, both mentally and physically.